Dr. Payne Perman, Kapilly Capelle, and Wefonne Billen, RHD coordinator. Rotary club members from left back Joe Felix, Jr., Konrad Englberger, Noel Boylan, Patrick Pedrus, Hon. George Fraser, Uta Krause, front Steve Finnen, Melner Isaac, Sharon Sawdey. 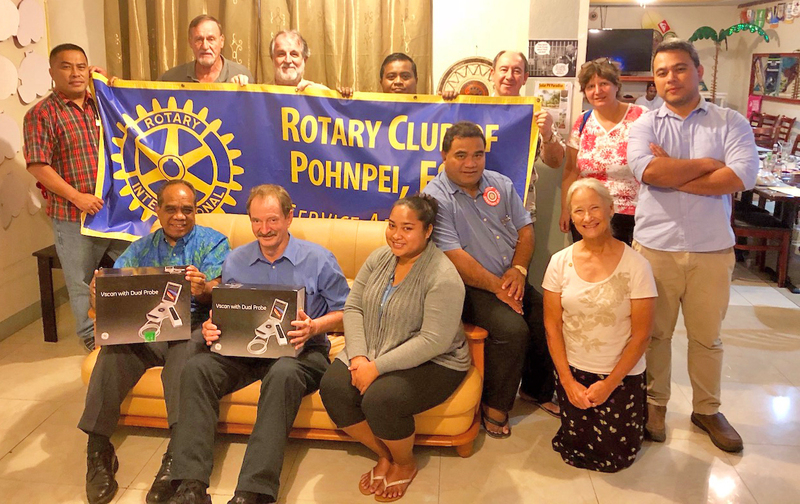 The Rotary Club of Pohnpei successfully received and donated two hand held scanners used for the detection of rheumatic heart disease in children. These scanners were donated to Pohnpei Health, represented by its director Kapilly Capelle, Dr.Payne Perman and Wefonne Billen. RHD is a serious disease. It is generally caused by strep throat in young children which is not treated. The disease can then take hold in the heart ultimately causing severe problems which if left untreated can cause death at a young age. Once the disease reaches a serious stage, heart valve replacement is necessary. The purpose of the scanners is to assist in early detection. The disease, once it is in place cannot be cured but it can be halted before catastrophic damage occurs. The earlier the detection the easier the treatment. Pohnpei Public Health has been conducting screenings of school age children to try and detect the disease. The next big screening is set for March, 2018. To provide an idea of the size of the problem in Pohnpei, the typical incidence of RHD in school age populations is under .01%. That is a very small number. Screenings in Pohnpei have shown an incidence of approximately 9-10% of all those tested. Treatment if detected early enough consists of a regimen of antibiotics, which can prevent huge problems later on. The hand held scanners are to be used at the big screening in March, and for screenings at the schools in the future. The more kids tested, the more kids that can be treated. Training will take place at the March screening to use the hand held scanners, and nurses are to be trained to provide the screenings. More complex diagnostic tools require a specialized doctor to operate them. The Rotary Club of Pohnpei is happy to contribute and pursue this worthwhile project. Each of the scanners costs about $4,300.00. Support for this project was widespread. One of the scanners was purchased by nine clubs in Japan, Tokyo Akasaka RC, Tokyo Ginza RC, Tokyo Tsukiji RC, Tokyo Shinagawa RC, Tokyo Ebisu RC, Tokyo Hiroo RC, Tokyo Seijyo-shin RC, Tokyo Musashi-Fuchu RC, Tokyo Chuo RC, who are all part of an organization formed and called The Committee for Palau & Micronesia Education and Health Care Support in Tokyo. Many thanks to them for their wonderful support. The other scanner was purchased by the Rotary Club of Pohnpei with assistance from clubs in our region, known as the Pacific Basin Group. This is a big project and we are very thankful that the Rotary Clubs can be of assistance. We hope to make even more contributions in the future.